Home » 100,000th AreaMax Installed! » News » 100,000th AreaMax Installed! At Evluma, the outdoor LED lighting experts, we’re proud to announce the installation of the 100,000 AreaMax shipped. Evluma shipped the unit in February and it was installed in April, 2016. 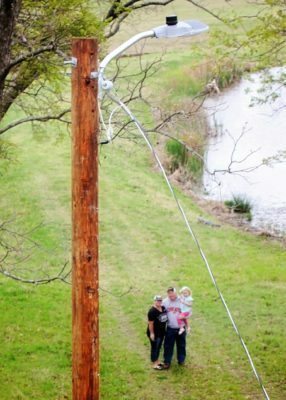 When Dan Smith and his family decided they wanted a security light to help protect their new home just west of Beggs, OK, they called East Central Electric Cooperative. 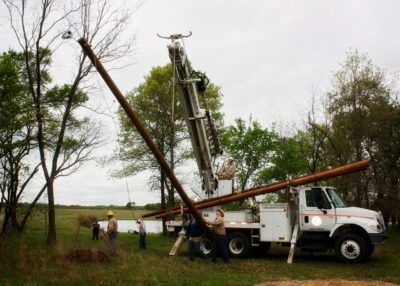 With the AreaMax, East Central Electric Cooperative is guaranteed to save on maintenance, energy, and time while enjoying the lowest cost of ownership of any LED area lighting system on the market. 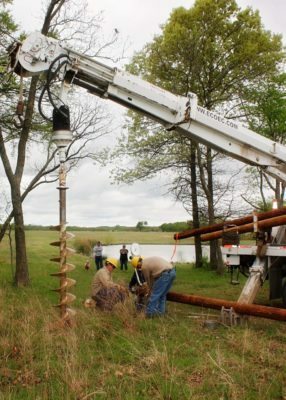 East Central Electric Cooperative drilled a hole, mounted the new AreaMax and lifted the fully equipped pole into position. 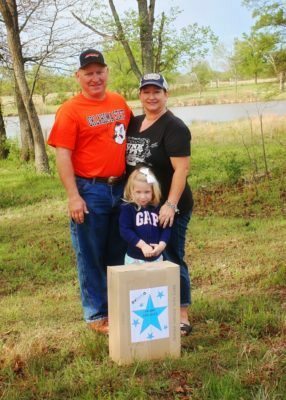 Dan and his family can now feel comfortable and confident in knowing that the AreaMax LED Area Light will continue to provide outstanding quality while ensuring the family’s illumination needs are thoroughly met. At Evluma, we’re incredibly proud of reaching this milestone. We’d like to thank Dan and his family for allowing us to share their story here, and to take a moment to thank each and every one of the customers that came before in our march to 100,000! When you become an Evluma customer, you’re joining a team of innovative engineers dedicated to solving the problem in the best possible, most user-friendly way. Whether that’s providing lighting a yard light or offering illumination solutions for public streets or parks, the outdoor LED lighting experts at Evluma have you covered. Take a look at some of the photos below of our 100,000th AreaMax being installed. Dan and his family eagerly awaiting the installation of their new AreaMax LED Lighting system. Our crew carefully drilling the hole for the AreaMax. The Smiths decided to place the light near a pond on the property. Once in place, the AreaMax will provide Dan and his family state-of-the-art illumination at a low monthly cost. The Smiths can feel comfortable knowing their new AreaMax will provide the dependable lighting solution they need to feel safe at home.